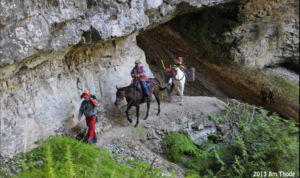 After over 40 years of keeping trails open for horse use, Back Country Horsemen of America still stands up for the recreational horseback rider who ambles about the front country for an hour or two, as well as the outfitter with a six-mule pack string and no plans with civilization for the next month. In addition to countless hours of trail maintenance, BCHers meet regularly to make sure they’re doing all they can to protect our right to ride horses on public lands. Back Country Horsemen of America will be holding their annual board meeting April 22-25, 2018, in Airway Heights, Washington. Instead of having outside speakers address the Board, this year they’ll be working together to identify regional and national issues that need attention and brainstorm solutions. With this information, the committees will formulate action plans in the areas of Education, Media & Marketing, Expansion, Fundraising, Volunteer Hours, State & National Public Lands, and Partnerships/Advocacy for the remainder of 2018 and 2019. Back Country Horsemen of America is standing firm on upholding the integrity of the Wilderness Act of 1964. A small, infant group of mountain bikers is pushing to allow violation of the Act’s restriction on mechanical transport, even though the International Mountain Bicycling Association does not support them. The group is challenging Section 4(c) of the Wilderness Act, which states: “…there shall be…no use of motor vehicles, motorized equipment…and no other form of mechanical transport…” Clearly, bikes are mechanical transport. In addition, the Wilderness Act was reinterpreted by the Administration in 1986, upholding the ban on bicycles. Only 2.7% of the land in the continental US is designated Wilderness. That’s precious few acres where horsemen and other recreationists can escape and be assured of a relatively primitive recreational experience. According to the US Forest Service, 98% of all the trails on land it manages outside of designated Wilderness are open to bicycles. This and other agencies continue to create and open new mountain biking trails across the country, giving mountain bikers ample acreage to recreate without harming our fragile wild lands. Further, the rapid speeds at which many mountain bikers travel, combined with their nearly silent approach, creates a significant safety hazard for other recreationists on foot or on horseback on steep, narrow, or winding trails. BCHA will continue to support preserving the integrity of the Wilderness Act. Back Country Horsemen of America worked hard to promote the passing into law of HR 845, the National Forest System Trails Stewardship Act. This new law addresses the extreme lack of trail maintenance on federal public lands. It states that the 158,000-mile National Forest trail system has a maintenance backlog of $314 million. According to the Government Accountability Office, “the Forest Service is only able to maintain about one-quarter of National Forest System trails to the agency standard.” When trails aren’t maintained, they’re closed. That’s why Back Country Horsemen of America spends so much time doing what needs to be done – so trails stay open for all users to enjoy. The National Forest System Trails Stewardship Act is an important initiative that removes some of the barriers within the US Forest Service that prevented the public from doing more trail maintenance. It also directs the agency “to increase trail maintenance by volunteers and partners by 100%” within five years of its enactment. Drawing on this country’s pool of enthusiastic volunteers helps get this work done without putting more pressure on already strained federal resources. The passage of the National Forest System Trails Stewardship Act is a huge win for trail users of all kinds, but it’s also a boon for rural economies. Recreational horseback riding alone is a $32 billion industry. When any trail user travels to a public land to recreate, they spend money on fuel, food, lodging, and more. 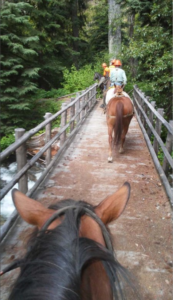 Back Country Horsemen of America expended considerable time and effort over four years in promoting the passage of the National Forest System Trails Stewardship Act. As a result, they are taking advantage of the opportunity to increase their volunteerism on National Forest lands. They’re also pleased that the passing of this bill is leading to greater public appreciation for this finite resource and increased federal funding to protect recreation on our wild lands. Back Country Horsemen of America also tackles a myriad of other issues at their annual meeting, such as redesigning trailheads to allow horse riders a more pleasant recreation experience; planning educational campaigns to promote trail sharing, wilderness safety, and responsible recreation; and brainstorming creative solutions to limit conflicts between equestrians and other trail users.